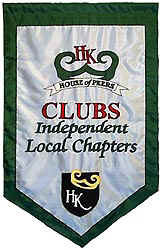 Clubs authorized by Harmony Kingdom may become member clubs of the House of Peers. Each club appoints a delegate to serve on the council. Individuals may join these independent clubs. Visit each independent HOP club page for further information. The HK House of Peers is governed by its Bylaws. They were adopted on December 1, 1999, and have been ammended on February 29, 2000, and April 11, 2008. They provide the guidelines for our non-profit organization founded by authorized independent Harmony Kingdom Collector Clubs. The House of Peers provides assistance and support to new independent clubs at any stage of their organization. Questions are encouraged and should be directed to [Pat Steven] the HOP Secretary. The following Harmony Kingdom Authorized Independent Clubs have chosen to participate in the House of Peers. contact a club in your area for meeting details. This logo is only available for use by a HOP Independent Club. Please request permission using the email address below. © 1999-2019 HK House of Peers. All rights reserved. All images and content © 2019 HK House of Peers. All rights reserved.